There's no doubt that television technology has made great strides. We're on the threshold of having an 85" 33-megapixel TV to hang on our walls (for most of us, it will have to be in the garage, of course), or if that's too ostentatious, you can put in an order for Samsung's new 70 incher, if you're willing to settle for a mere 8 million pixels of Dr. Phil. But for some of us, we harken back to a simpler time, when a guy (and not just MacGyver), with nothing more than five simple tools and sweat of his brow, could build his own TV, and a color one at that, complete with an "ultra-rectangular," 25" (315 sq-inch) screen that provides almost immediate access to 24 channels, more than you'll ever need if you're expecting quality programming. 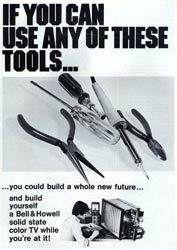 The ad on the right (click to enlarge, and to dig that cool 70s 'do) appeared in the January, 1973 edition of Cycle Magazine, complete with a postcard (postage-paid, no less) to get more information about enrolling in the Electronics Home Study School offered by DeVry Institute of Technology (a Bell & Howell School). 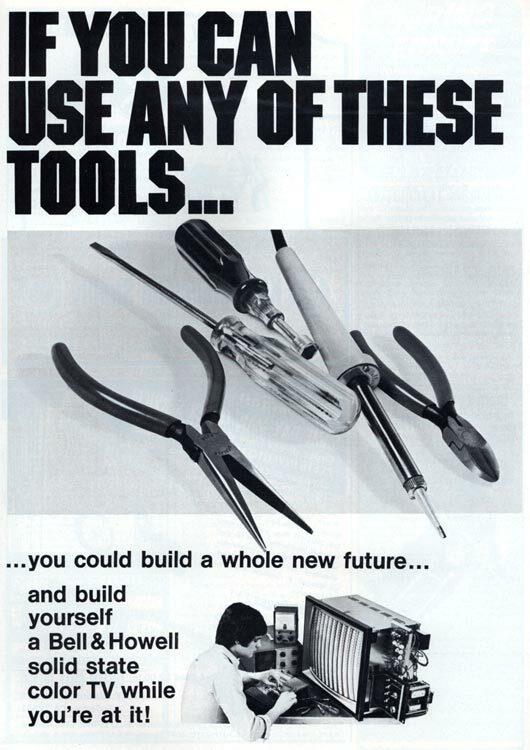 If you successfully completed the course, you got to keep the Bell & Howell Solid State color TV that you built. Plus, as the ad revealed, "You might even end up with a business of your own in color TV servicing." The magazine also has an ad for Record Club of America: "FREE! up to 25 Stereo LPs or 15 Tapes (cartridge or cassette) with NO OBLIGATION to BUY ANYTHING EVER!" Did you fall for that one? This page contains a single entry by Eric published on June 7, 2011 5:43 PM. Random Weinergate Observations was the previous entry in this blog. Driving the Noisy Roads of Texas is the next entry in this blog.